The Company setup is necessary for payroll, tax reports, etc. You need to do this only once unless there are changes. Go to Back Office - Payroll - Payroll Control Files - Company Information. Force minimum wage (Y,N,G) - This applies to employees such as F&B servers who make less than minimum wage, with the supposition that the server will be paid tips. Answer N to not force minimum wage; answer N to add to Gross only; answer G to add to Gross and Net. If you are not sure, ask your accountant. Minimum wage hourly rate - If you are forcing minimum wage, enter the minimum wage amount here. Otherwise you may leave this field blank. Post G/L (C)heck or (P)eriod Date - Answer C if you want this payroll to post to General Ledger for the Check date. Answer P if you want this payroll to post to General Ledger for the Period date. 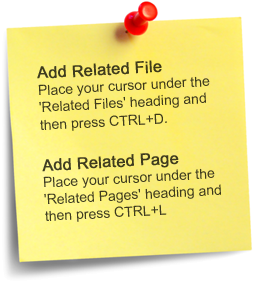 Both the Check date and Period date are entered by you each payroll in Current Payroll Setup in Payroll Control Files. Cafeteria plan hospitalization? - Answer Y if you have a cafeteria plan deduction. 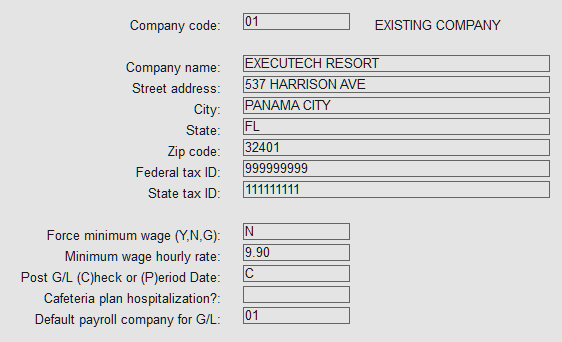 This uses Deduction 1 on the Employee Setup. If you are not sure, ask your accountant. Default payroll company for G/L - If you have more than one company, enter the two-digit company where you will run payroll.